The Big Wobble: At a whopping 8,776 square miles (22,730 sq km): The Gulf of Mexico has yielded the largest 'dead zone' ever recorded in the area. At a whopping 8,776 square miles (22,730 sq km): The Gulf of Mexico has yielded the largest 'dead zone' ever recorded in the area. Perhaps this year's record-setting dead zone will finally get a serious conversation started? A recent expedition to the Gulf of Mexico has yielded the largest 'dead zone' ever recorded in the area. Measuring 8,776 square miles, this massive patch of oxygen depleted water is wreaking havoc on the Gulf's marine life - a consequence of unchecked agricultural runoff pouring down from the Mississippi River. Dead zones appear in the Gulf every summer, and the typical size is around 5,800 square miles. Back in 2002, scientists detected an unusually large dead zone stretching for 8,497 square miles, but this new one, detected just last week, is now the largest ever recorded. At a whopping 8,776 square miles (22,730 sq km), it's 4.6 times larger than the target size set by the Gulf Hypoxia Task Force. In the words of the National Oceanic Atmospheric Administration, this finding shows that "nutrient pollution, primarily from agriculture and developed land runoff in the Mississippi River watershed is continuing to affect the nation's coastal resources and habitats in the Gulf." Hypoxia is a fancy term for low oxygen, and it's primarily a problem for estuaries and coastal waters. These dead zones have dissolved oxygen concentrations of less than two to three parts per million, and they're triggered by a variety of factors. In the case of the Gulf of Mexico, excess nutrients stream down the Mississippi river, stimulating massive algal growths that eventually decompose - a process that depletes the oxygen required to support marine life. Sources of these nutrients include fertilisers from agriculture, golf courses, and suburban lawns, erosion of soil packed with nutrients, and sewage discharge from treatment plants. Dead zones can cause a loss of fish habitat, or force fish to migrate to other areas to survive. They can also cause reproductive issues among marine animals. Studies suggest that dead zones in the Gulf are leading to fewer large shrimp, for instance. There are over 400 hypoxic zones in the world, but the Gulf of Mexico dead zone is the largest in the US, and one of the largest globally. The latest measurements in the Gulf were made by a team of scientists led by Louisiana State University and Louisiana Universities Marine Consortium (LUMCON). Data was recorded aboard the RV Pelican from July 21 to 31. Sadly, the size of the dead zone didn't come as a surprise. 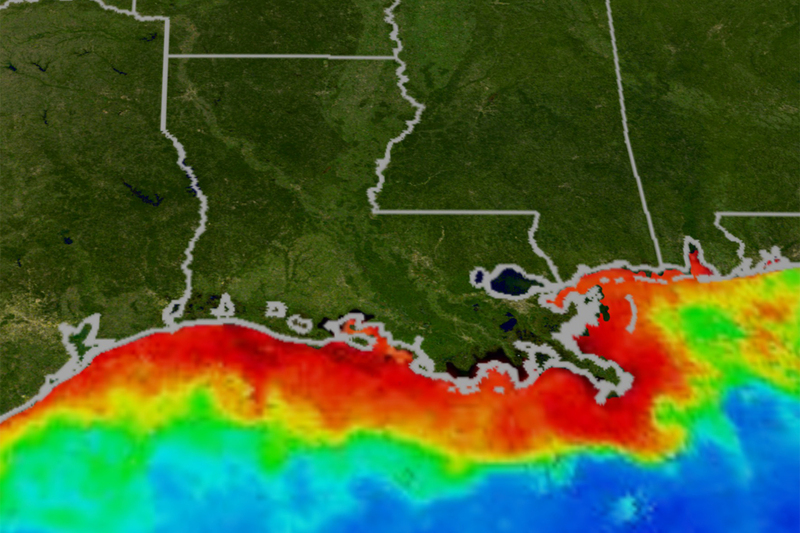 "We expected one of the largest zones ever recorded because the Mississippi River discharge levels, and the May data indicated a high delivery of nutrients during this critical month which stimulates the mid-summer dead zone," said LSU scientist Nancy Rabalais in a statement. These findings suggest that efforts to reduce nutrient pollution in the Mississippi River basin aren't working. The Runoff Risk Advisory Forecast, an initiative to help farmers apply fertilisers at optimum times, is either ineffective or being ignored. Dead zones obviously affect the fishing industry, but as for farmers, not so much. It's not immediately clear how voluntary measures to rectify the situation are actually going to shrink the Gulf Zone's dead zone to an annual average of 1,900 square miles, a goal set by the Gulf Hypoxia Task Force. Perhaps this year's record-setting dead zone will finally get a serious conversation started. Below the Big Wobble's report of the United Dead Zone Of North America, two years ago!